Tacos are great. Octopus tacos are amazing. 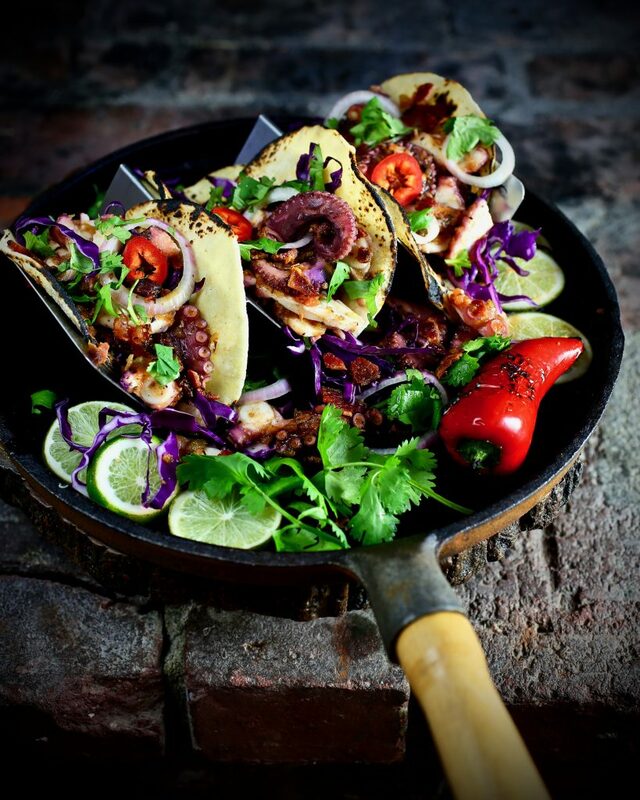 Octopus tacos with bacon are over-the-top! 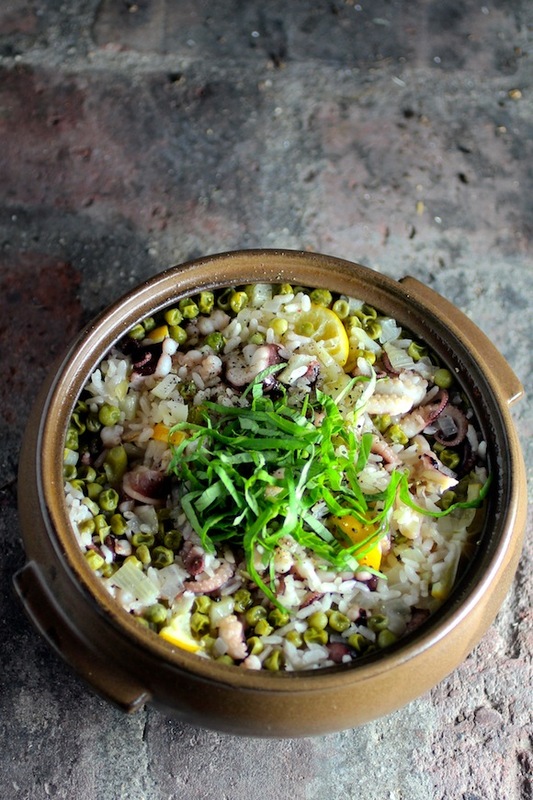 Braised octopus’ mild flavor is enhanced by bright lime juice and roasted tomato salsa. 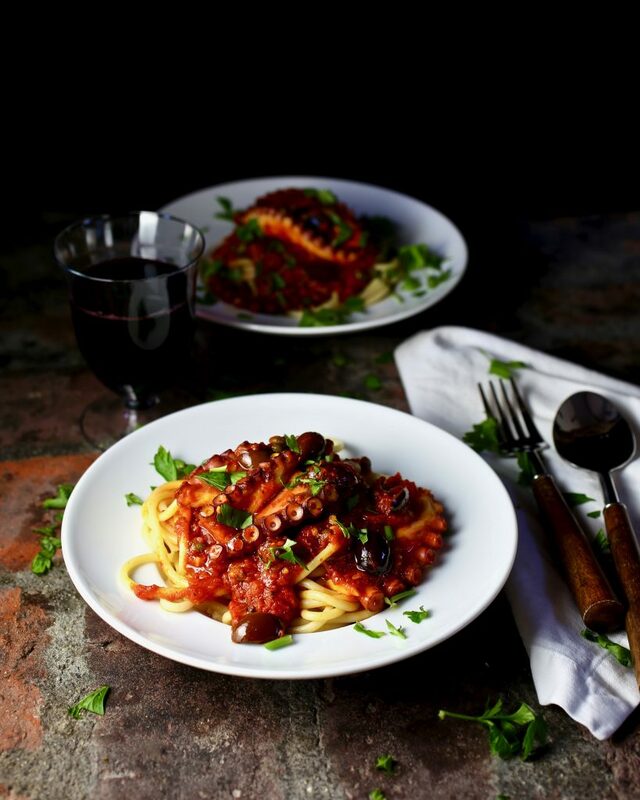 Its lean, chewy, tender texture is balanced by crispy, salty, smoky bacon. When paired with crunchy purple cabbage, spicy red jalapeño, herbaceous cilantro, and pungent onion all nestled in charred corn tortillas we end up with some extraordinarily tantalizing tacos. Ones that are bursting with a wild range of flavors, colors, and textures. Ingredients. Ingredients were the inspiration for this “casserole.” A brown paper bag full of gorgeous Meyer Lemons from my friend Judy’s yard. A Christmas gift of heavenly Lemon Olive Oil from my friend Allison. (Thank you, ladies). A charming cloth bag of arroz tradicional from Spain. 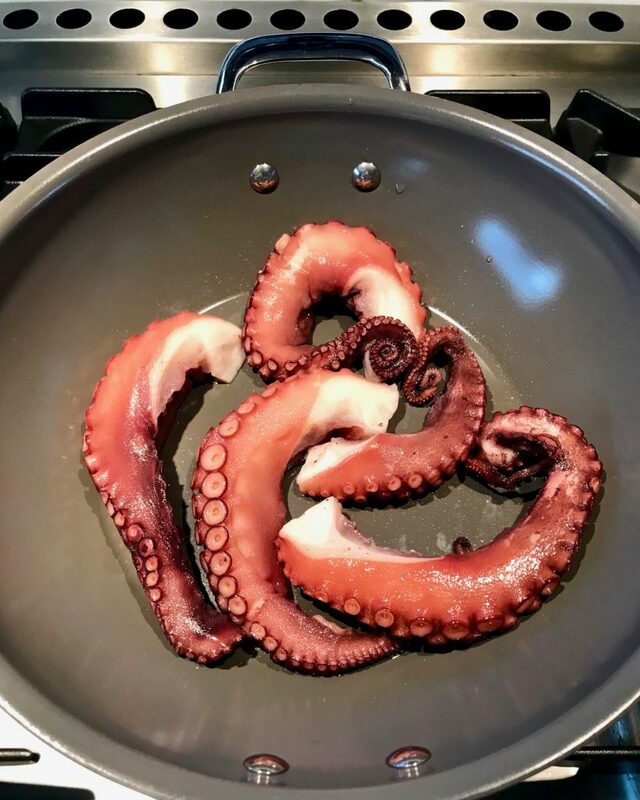 And irresistible fresh baby octopus at my local Korean market. Just a few ingredients result in a smashing summer salad. 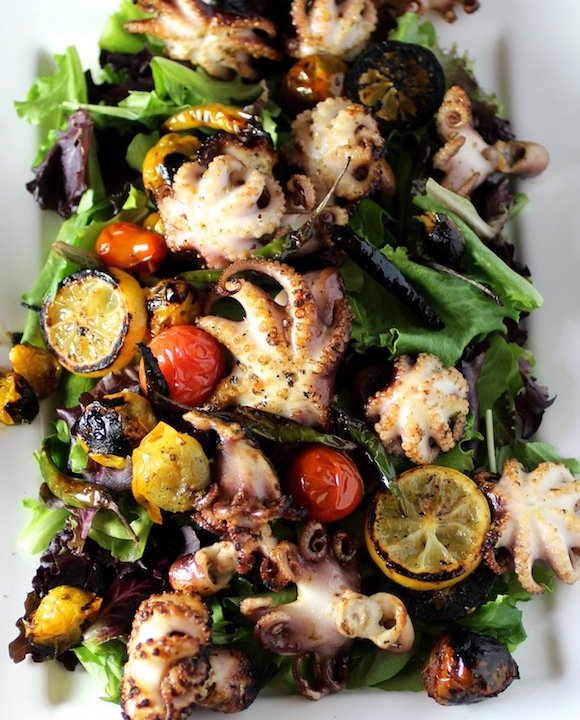 Charred baby octopuses are the star, supported by hot cherry tomatoes that burst in the mouth. Blistered chili peppers satisfy the craving for hot weather piquancy. It all comes together with a lemony dressing flavored with oregano and garlic. 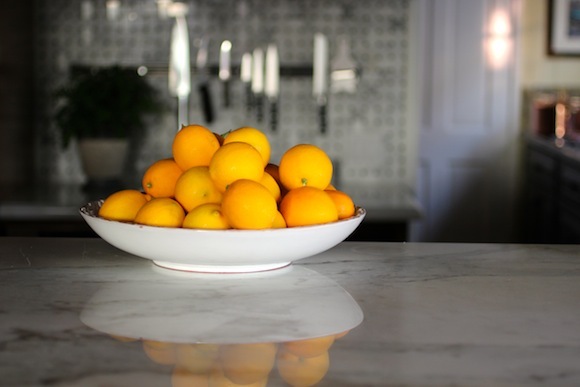 Gorgeous colors, interesting textures, bold flavors. This salad makes a great addition to any summer buffet. 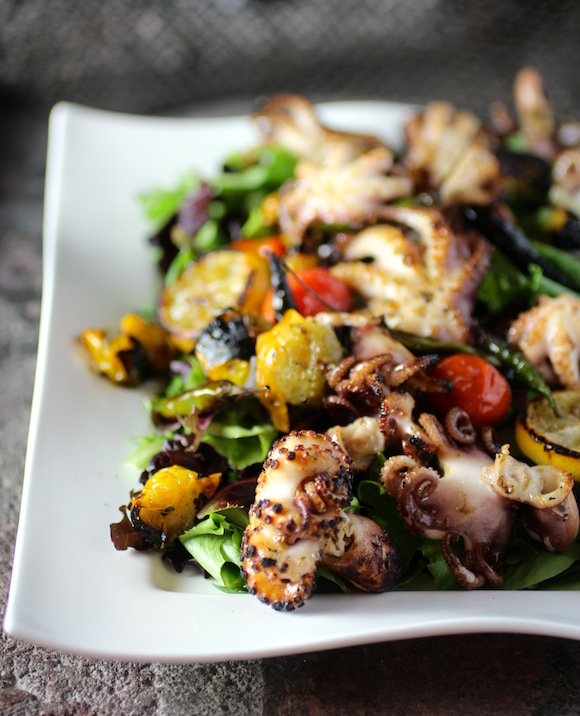 Par-boil the octopodes ahead of time, then this salad can be prepared in just a few minutes on a hot barbecue. 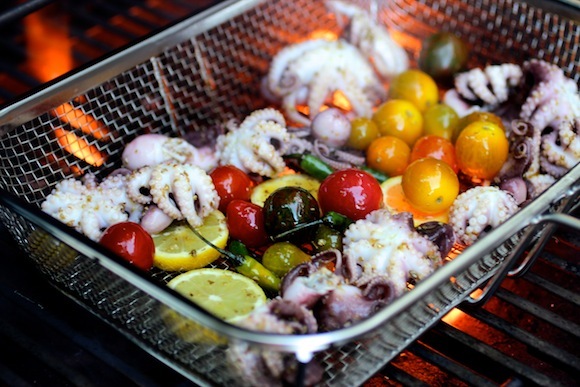 A grill basket makes cooking a snap!